Retired Buffalo Mafia member Sam DiCarlo, brother of the notorious Joseph DiCarlo, died March 27, 1987, in Miami, Florida, at the age of 82. While often in the shadow of his better known brother, Sam DiCarlo was an influential underworld leader and participated in some of the more important Mafia events in U.S. history. Born Salvatore DiCarlo on April 2, 1904, he was the fourth child (third son, after Francesco and Giuseppe/Joseph Jr.) of Giuseppe and Vincenza Grasso DiCarlo of Vallelunga, Sicily. At the age of two, "Sam" crossed the Atlantic with his mother and siblings. Giuseppe DiCarlo had made the trip the previous September, settling in a New York City colony of Vallelunghesi that included the related Mistretta, Muscarella and Bonasera clans. Giuseppe was late meeting his family at Ellis Island, and the first meal eaten in America by Vincenza and her children was the boxed lunch provided by the immigration center. The family lived briefly in Brooklyn and then moved in 1907 to Manhattan's East Harlem. Giuseppe DiCarlo commuted to work at a Manzella grocery business, 190 Elizabeth Street, between Spring and Prince Streets. Giuseppe was friendly with Pasquale Enea and Isidoro Crocevera, associates of local Mafia leader Giuseppe Morello. In summer 1908, apparently with the blessing of Morello, Giuseppe DiCarlo became boss of the Mafia organization in Buffalo, New York (he had been a regular visitor to the city since March 1907), and resettled his family there. Sam and the other DiCarlo children grew up in comfort, thanks to their father's position. But the family was not immune to tragedy. Francesco just reached the age of eighteen when he was diagnosed with tuberculosis in January 1917. He died of the disease in March 1918. The following year, Vincenza, age forty-six, died following cancer surgery. Sam was in his early teens when brother Joseph (four and a half years older than Sam) became an aide to their father in the early days of Prohibition. Joseph was involved in a shooting incident in August 1920 that left one man dead and one man wounded. The wounded man was Vincent Vaccaro, connected with local Black Hand extortion rackets. The dead man was eventually identified as Giuseppe DiCarlo's old friend Isidoro Crocevera. Police pieced together enough about the incident to decide that it was related to a squabble over bootlegging proceeds. Joseph DiCarlo was charged with first-degree assault in the shooting of Vaccaro. Vaccaro's brother Anthony was charged with Crocevera's murder. Witnesses refused to cooperate with authorities, and the charges were later dropped. Sam got into trouble with the law at about the same time. At the age of sixteen, he and a nineteen-year-old friend were arrested for assaulting two young women. Charges were dismissed. Giuseppe DiCarlo died July 9, 1922, at the age of forty-eight. The cause of death was reported as acute pulmonary edema. 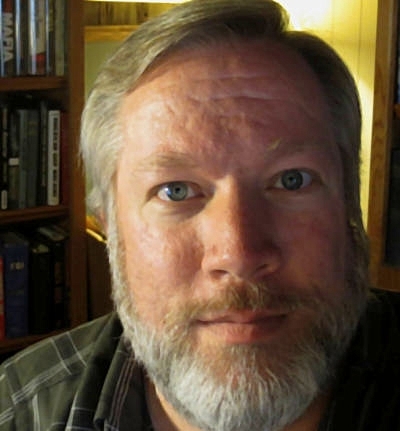 Ill (and likely depressed) for years, with diabetes and heart and kidney problems, he had recently pulled out of a number of legitimate businesses and spent his time at a "country home" in Bowmansville, New York. His death left the Mafia of western New York leaderless. Sam was eighteen and Joseph was twenty-two. Buffalo Mafia leaders considered installing Joseph as the new boss, but decided he did not have the maturity for the position. Angelo Palmeri was given the nod instead, perhaps as a sort of regent for Joseph. Joseph's path toward the top spot in the organization set up by his father was blocked by the Buffalo arrival of Stefano Magaddino later in 1922. Palmeri turned power over to the more senior Castellammarese Mafioso. Joseph viewed Magaddino as a rival and an obstacle and spent the rest of his life trying to build an underworld organization of his own. Sam DiCarlo, however, seemed to have an easier time finding his place in a crime family run by Magaddino. He became a Magaddino ambassador, representing his boss at national Mafia events. During his underworld career, Sam DiCarlo was arrested twice at Mafia conventions. The arrests helped to reveal the interstate nature of organized crime many years before the famous gathering at Apalachin, New York. In the summer of 1932, Sam DiCarlo was found with gathered Mafiosi from around the country in New York City. At the time, Sam was free on bail pending his appeal of a year-and-a-day federal sentence for interstate transport and possession of a stolen automobile. He was taken into custody as New York police investigated the ice pick murder of visiting Pittsburgh crime boss John Bazzano. A loose-cannon in the Mafia, Bazzano had recently ordered the killing of several Neapolitan associates, apparently as a form of ethnic cleansing in his underworld organization. Bazzano was called to New York by Mafia higher-ups to answer charges. His answer was deemed insufficient, and he was executed. Sam's appeals kept him out of federal prison long enough to attend the summer 1933 wedding of his sister Sarah to Cassandro "Tony the Chief" Bonasera. 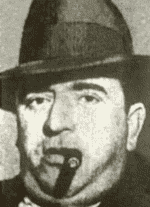 A member of the Brooklyn-based Profaci (later Colombo) Crime Family, Bonasera was one of the Mafiosi rounded up following the murder of Bazzano. Frustrated by Magaddino's increasing power and influence in western New York, Joseph DiCarlo began to search for greener pastures. In the mid-1940s, he established himself as leader of gambling operations in the City of Youngstown, Ohio. He was assisted in that role by his brother Sam, two brothers-in-law of the Pieri family and John "Peanuts" Tronolone (later Mafia boss of Cleveland). The DiCarlo brothers within a few years also involved themselves in gambling rackets in Miami Beach, Florida. These rackets were exposed through the Kefauver Committee hearings of the early 1950s. Sam DiCarlo and John Tronolone were arrested together at a Miami Beach barbecue restaurant on New Year's Eve, 1953. They were charged with running a gambling house, gambling and bookmaking. Joseph DiCarlo was arrested a few days later. The U.S. Senate's McClellan Committee opened hearings into organized crime in summer of 1958. As it did so, it published the names of 135 individuals who were found to be attendees or associates of attendees of the November 1957 Apalachin meeting. Joseph and Sam DiCarlo were included on that list. Sam DiCarlo, in his mid-fifties, seems to have made it a point to avoid public scrutiny following the McClellan Committee revelations. The underworld career of his big brother Joseph was far from over. In the late 1960s, Joseph DiCarlo returned to Buffalo to aid and advise the Pieri faction in a revolt. Under the leadership of Sam Pieri and Joseph DiCarlo, the Mafia organization within the City of Buffalo broke away from the regional Mafia of western New York commanded from the Niagara Falls area by Stefano Magaddino. Diminished in power and influence, Magaddino died after a heart attack in 1974. Sam DiCarlo was the longest-lived of his siblings. Sarah DiCarlo Bonasera died October 19, 1975, in Brooklyn at the age of seventy-three. After more than a decade as consigliere of the Buffalo Crime Family he helped build, Joseph DiCarlo died Oct. 11, 1980, at the age of 80. A resident patient of the Four Freedoms Manor facility in Miami, Sam DiCarlo died at the age of eighty-two following a stroke. DiCarlo: Buffalo's First Family of Crime - Vol. 1, to 1937, by Thomas Hunt and Michael A. Tona. DiCarlo: Buffalo's First Family of Crime - Vol. 2, from 1938, by Thomas Hunt and Michael A. Tona. Two old friends from Sicily, recently reacquainted in New York City, went out hunting in the woods along New Jersey's Shark River on July 30, 1921. Only one of the men returned. Bartolomeo Fontana, the survivor of the hunting trip, later confessed to New York City Police that he deliberately brought his pal Camillo Caiozzo into the woods and shotgunned him to death on orders of a Brooklyn-based criminal network known as "the Good Killers." Investigation of the Good Killers revealed an interstate organization responsible for many murders around New York City and Detroit, in the United States, and in the Castellammare del Golfo region of Sicily. Gang commanders included Stefano Magaddino, who would soon rise to lead the Mafia in Buffalo, New York. More about this murder and the Good Killers gang:"The Good Killers: 1921's glimpse of the Mafia," by Thomas Hunt and Michael A. Tona. 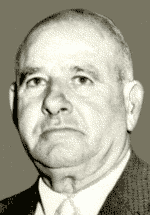 On November 14, 1957, Sergeant Edgar Croswell of the New York State Police, aided by troopers from the Vestal barracks and agents of the Treasury Department, broke up a convention of American mobsters at the rural Apalachin home of regional crime chieftain Joseph Barbara Sr. Scores of Mafiosi from around the country were rounded up and identified. With known criminal figures from every region of the country in attendance, the crashed party at tiny Apalachin triggered years of investigations and compelled reluctant federal law enforcement officials to acknowledge the existence of a highly organized, interstate network of racketeers. Croswell learned a day earlier that Joseph Barbara's son made a number of room reservations at the Parkway Motel on Route 17 in Vestal. Knowing of Barbara's underworld connections, the police sergeant and Trooper Vincent Vasisko investigated. They drove up to the Barbara residence, a large stone house surrounded by fifty-three wooded acres on dead end McFall Road in Apalachin. They noted the license plates of the few cars they saw parked on the grounds. One was registered in New Jersey. The officers went back to the Parkway Motel later in the evening of November 13 and found an Ohio-registered Cadillac. When Croswell learned that several men had checked into one of the rooms reserved by the younger Barbara, he asked motel proprietor Warren Schroeder to have the occupants sign registration cards. The men refused to give their names. Barbara had a record as a bootlegger, so Croswell contacted the Treasury Department’s Alcohol and Tobacco Unit. Agents of the unit arrived in Vestal on the morning of November 14. The troopers and agents drove over to the Barbara estate. They observed a half dozen, expensive, new cars in a parking lot. Many more vehicles could be seen parked behind the home’s detached garage. The Barbaras apparently were hosting a large gathering. Croswell called the barracks for additional help and advised Inspector Robert E. Denman of the state police headquarters in Sidney, New York. With no warrant for Barbara’s home and no official justification for setting foot on his property, the troopers recorded the license plate numbers of visible automobiles and then set up a roadblock on the nearest state road, Old Route 17. They monitored traffic passing through toward McFall Road and stopped every vehicle leaving the area, demanding identification from drivers and their passengers. Word of the police presence outside the estate reached Barbara’s guests by early afternoon, and dozens of men suddenly poured from the home. Many attempted to leave by automobile but were halted at the law enforcement roadblock. Elmira NY Star-Gazette, Nov. 15, 1957. At twenty minutes after one, a car carrying Barbara’s longtime friend Emanuele Zicari and Dominick Alaimo of Pittston, Pennsylvania, was the first to reach the roadblock. Troopers next stopped a black, 1957 Chrysler Imperial registered to William Medico of Pennsylvania. Inside they found New York-New Jersey Mafia leaders Vito Genovese, Gerardo Catena, Joseph Ida and Dominick Oliveto, along with Rosario “Russell” Bufalino of Pennsylvania. A 1957 Cadillac contained Cleveland Mafia boss John Scalish; John DeMarco of Shaker Heights, Ohio; James LaDuca of Lewiston, New York; and Roy Carlisi of Buffalo. Brooklyn underworld figures Carlo Gambino, Armand Rava and Paul Castellano were stopped in a borrowed car chauffeured by Castellano. In another vehicle police found Pittsburgh Mafiosi Michael Genovese and Gabriel “Kelly” Mannarino, traveling with Pittston, Pennsylvania, gangsters James Osticco and Angelo Sciandra. Some of Barbara’s guests, either lacking automobiles or deciding that escape by road was impossible, ran off into the hilly woods and open fields surrounding the Barbara estate. Observing that suspicious behavior, police pursued them. Antonino Magaddino, brother of western New York Mafia boss Stefano Magaddino, was apprehended at McFadden Road to the east of the estate. John C. Montana of Buffalo and Brooklyn underworld leaders Joseph Bonanno and John Bonventre were found in a cornfield nearby. When police reached him, Montana was tangled in a barbed wire fence. James Colletti of Pueblo, Colorado, and Simone Scozzari of San Gabriel, California, slid down a brushy hill to the west of Barbara’s home and were gathered up by police on the avenue leading to the Pennsylvania state line. Santo Trafficante, the crime boss of Tampa, Florida, and the representative of a growing number of Mafia investors in Cuban gambling casinos, was extracted from a wooded area near Barbara’s home. The law enforcement operation in Apalachin ultimately collected almost sixty underworld figures. Two more – Nick Civella and Joseph Filardo of Kansas City – were picked up fifteen miles away at the Binghamton train station as they attempted to arrange transport home. All the captured men were brought to the Vestal barracks to be identified and questioned. None provided a reasonable explanation for the gathering at the Barbara home; most insisted that they had all coincidentally dropped in to visit their ailing friend Joseph Barbara Sr., who recently had suffered a heart attack. Genovese, Ida, Catena and Oliveto refused to answer any questions. The authorities were convinced that the gathering had been prearranged for a far more sinister purpose. (Some suggested the meeting was held in order to establish a uniform policy with regard to narcotics trafficking. Others felt it was to divide up the rackets of the recently murdered Albert Anastasia or to settle succession issues in his Mafia organization, later known as the Carlo Gambino Family. Still others speculated that the purpose was to endorse the takeover of Lucky Luciano's former crime family by Vito Genovese.) However, with no legal grounds for holding the men, police had to turn them loose. Apalachin, Binghamton, Endicott, New York – Joseph Barbara Sr., Joseph Barbara Jr., Ignatius Cannone, Anthony Guarnieri, Bartolo Guccia, Pasquale Turrigiano, Emanuele Zicari. Auburn, New York – Sam Monachino, Patsy Monachino, Patsy Sciortino. Boston, Massachusetts – Frank Cucchiara. Buffalo, Niagara Falls, New York – Roy Carlisi, Domenick D’Agostino, James V. LaDuca, Sam Lagattuta, Antonino Magaddino, John C. Montana, Charles Montana, Stefano Magaddino. Chicago, Illinois – Salvatore “Sam” Giancana, Anthony Accardo. Cleveland, Ohio – John DeMarco, John Scalish. Dallas, Texas – Joseph Civello. Elizabeth, New Jersey – Joseph Ida, Louis Larasso, Frank Majuri. Essex-Bergen Counties, New Jersey – Salvatore Chiri, Anthony Riela. Kansas City, Missouri – Nick Civella, Joseph Filardo. Los Angeles, California – Frank DeSimone, Simone Scozzari. Miami, Florida – Bartolo Frank Failla. New York, New York (Bonanno) – Joseph Bonanno, John Bonventre, Natale Evola, Carmine Galante. New York, New York (Gambino) – Paul Castellano, Carlo Gambino, Carmine Lombardozzi, Armand Rava, Joseph Riccobono. New York, New York (Genovese) – Gerardo Catena, Vito Genovese, Michele Miranda. New York, New York (Lucchese) – Americo Migliore, Aniello Migliore, John Ormento, Vincent Rao, Joseph Rosato, Peter Valenti. New York, New York (Profaci) – Joseph Magliocco, Joseph Profaci, Salvatore Tornabe. Philadelphia, Pennsylvania – Dominick Oliveto. Pittsburgh, Pennsylvania – Michael Genovese, Gabriel Mannarino, John Sebastian LaRocca. Pittston, Scranton, Wilkes-Barre, Pennsylvania – Dominick Alaimo, Rosario Bufalino, William Medico, James Osticco, Angelo Sciandra. Pueblo, Colorado – James Colletti. Rochester, New York – Frank Valenti, Costenze Valenti. San Francisco, California – Joseph Cerrito, James Lanza. Springfield, Illinois – Frank Zito. Tampa, Florida, and Havana, Cuba – Santo Trafficante, Joseph Silesi. Utica, New York – Joseph Falcone, Salvatore Falcone, Rosario Mancuso. News of the roundup of national crime figures in tiny Apalachin shook the Federal Bureau of Investigation in Washington, D.C. Despite the earlier discoveries of the Kefauver Committee and other investigators, Bureau Director J. Edgar Hoover had insisted that criminal rackets were organized on no more than local or regional levels. The Apalachin incident revealed that known hoodlums from across the country were closely acquainted with each other. Many of the attendees were connected by business and/or family links. In the wake of Apalachin, the withering attention of media and law enforcement was focused on American Mafiosi from coast to coast. Investigations into the gathering and its attendees were launched by state and federal legislative committees, including the New York State Joint Legislative Committee on Government Operations and the U.S. Senate Select Committee on Improper Activities in the Labor or Management Field (McClellan Committee), as well as a federal grand jury in Albany and Hoover's greatly embarrassed Federal Bureau of Investigation. by Thomas Hunt and Michael A. Tona. Gentry, Curt, J. Edgar Hoover: The Man and the Secrets, New York: W.W. Norton & Company, 1991. Guthman, Edwin O. and Jeffrey Shulman, editors, Robert Kennedy: In His Own Words, New York: Bantam Press, 1988. Hart, Arthur V., "Meeting of Hoodlums, Apalachin, New York, November 14, 1957," FBI report from Albany office, July 8, 1958, file no. 63-4426-171, NARA no. 124-90103-10092. Hunt, Thomas, and Michael A. Tona, DiCarlo: Buffalo's First Family of Crime, Vol. 2 - From 1938, Hunt&Tona Publications, 2013. Kennedy, Robert F., The Enemy Within, New York: Harper and Brothers, 1960. McClellan Committee, “Hearings before the Select Committee on Improper Activities in the Labor or Management Field,” Part 32, Investigation of Improper Activities in the Labor or Management Field, Eighty-Fifth Congress, Second Session, Washington, D.C.: U.S. Government Printing Office, 1958. McClellan, John J., Crime Without Punishment, New York: Duell, Sloan and Pearce, 1962. Navasky, Victor S., Kennedy Justice, New York: Atheneum, 1971. Reuter, Arthur L., “Report on the activities and associations of persons identified as present at the residence of Joseph Barbara, Sr., at Apalachin, New York, on November 14, 1957, and the reasons for their presence,” State of New York Executive Department, Office of the Commissioner of Investigation, April 23, 1958. Roemer, William F. Jr., Roemer: Man Against the Mob, New York: Donald I. Fine, 1989. Ungar, Sanford J., FBI, Boston: Little, Brown, 1976. Fitchette, Woodie, and Steve Hambalek, "Top U.S. hoods are run out of area after 'sick call' on Barbara," Binghamton NY Press, Nov. 15, 1957, p. 1. "Cops spoil mobster Apalachin reunion," Elmira NY Star-Gazette, Nov. 15, 1957, p. 1. “How hoodlum rally went haywire,” Syracuse Herald Journal, Nov. 16, 1957, p. 1. "Cops probe convention of gangland," Pittsburgh Post-Gazette, Nov. 16, 1957, p. 1. Feinberg, Alexander, “U.S. taking steps to deport aliens at gang meeting,” New York Times, Nov. 24, 1957, p. 1. On this date in 1909: Seventeen-year-old Stefano Magaddino of Castellammare del Golfo, Sicily, arrived in New York City aboard the S.S. San Giorgio. Magaddino frequently traveled around the U.S. His 1913 marriage in Brooklyn did not settle him down. Within a few years, he moved his family to South Philadelphia but continued to spend considerable time in New York City. He also traveled to Buffalo, Chicago and possibly Detroit. Shortly after the start of Prohibition, Magaddino relocated to the Buffalo area. Almost immediately, he was selected boss of the western New York Mafia (previous boss Giuseppe DiCarlo died July 9, 1922). Magaddino remained the chief of the underworld in western New York and nearby Canada for more than fifty years. of the S.S. San Giorgio passenger manifest. DiCarlo: Buffalo's First Family of Crime by Thomas Hunt and Michael A. Tona. Preview DiCarlo: Buffalo's First Family of Crime, Vol. I, to 1937 on Amazon.com. Death of the Mafia's "Buffalo Bill"
A longtime leader in the Mafia of Western New York, Benedetto Angelo Palmeri died of natural causes at the age of 54. Widely known as Angelo and referred to by the Italian community as "Don Nitto,"
Palmeri had been ailing for months with symptoms of hypertension and kidney inflammation. At about one o'clock in the afternoon, Dec. 21, 2016, Palmeri stepped out of his home at 295 Jersey Street in Buffalo and climbed into his automobile. He was scheduled to meet a friend. A pedestrian happened to observe Palmeri slump behind the steering wheel and summoned assistance from the firehouse across the street. Firemen took the unconscious and dying Palmeri out of his car and attempted without luck to revive him. Though no autopsy was performed, officials decided the cause of death was a cerebral hemorrhage. Palmeri was well known for his tendency to wear cowboy hats and holstered sidearms. This fashion statement, combined with his Western New York hometown, caused the press to refer to him as "Buffalo Bill." Born in Castellammare del Golfo, Sicily, Palmeri reached the United States in 1906. His brother Paolo, who also became an important U.S. Mafioso, crossed the Atlantic to join him in New York City a few years later. 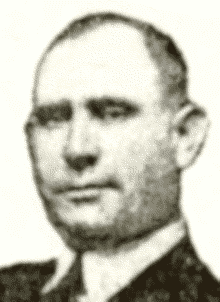 Angelo Palmeri moved on to Buffalo in 1911 and became a top lieutenant, business partner and valued friend of regional Mafia boss Giuseppe DiCarlo. He helped to establish a Mafia foothold in Niagara Falls, New York, and paved the way for Stefano Magaddino's arrival in Western New York in 1922. His death Wednesday brought sincere expressions of sorrow from hundreds of American citizens of Italian ancestry whom he had befriended in times of need... To the police he was known as a man who had close contact with many illicit enterprises, who had such power that he was able to bring peace between warring liquor runners – but to the citizens of the lower West Side he was their individual welfare department, a man who could and would aid them when pride kept them from appealing to the organized charities... Especially sad were the members of upwards of a score of families whose only source of food each Christmas for years had been Angelo B. Palmeri. Click here to read a brief biography of Bendetto Angelo Palmeri on the book website of DiCarlo: Buffalo's First Family of Crime by Thomas Hunt and Michael A. Tona. Thanksgiving Day hunters in Penfield, New York (just outside Rochester), discovered the beaten, mutilated and burned remains of a male murder victim. Rochester Democrat and Chronicle, Nov. 26, 1961. 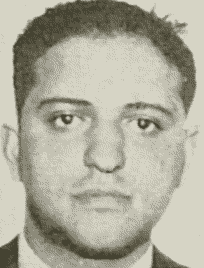 Days later, the FBI laboratory - using fingerprints from the remains - identified the victim as Albert George Agueci. Agueci, 39, a resident of Toronto, Canada, had been a narcotics racketeer working with the Magaddino Crime Family based in western New York. Albert Agueci, his brother Vito and 18 other people were charged in the summer with participating in a large narcotics operation. The arrests strongly suggested that regional crime boss Stefano Magaddino was engaged in narcotics trafficking in violation of a Mafia Commission policy. Albert Agueci and a number of co-defendants were released on bail. One co-defendant, William "Shorty" Holmes, was soon found shot to death in the Bronx. As the date of trial approached, Albert Agueci disappeared. Vito and ten other defendants in the narcotics case were on trial in U.S. federal court in New York City when Albert's charred remains turned up. The brutal gangland slaying was viewed both as a Magaddino disciplinary effort and as the boss's attempt to distance himself from the narcotics ring. For more about Agueci, Magaddino and the Mafia of western New York, see DiCarlo: Buffalo's First Family of Crime, Volume II. Evidence of lingering hostility: Bioff's garage, Nov. 4, 1955. 1928 - Underworld chief Arnold Rothstein was shot and mortally wounded in Manhattan's Park Central Hotel. A hotel employee discovered the collapsed Rothstein inside the Park Central's Fifty-Sixth Street service entrance. The renowned gambler / racketeer / narcotics importer was taken to Polyclinic Hospital, where surgeons attempted to repair damage to his lower abdomen caused by a .38-caliber bullet. Rothstein died two days later. The path of the bullet, determined at autopsy, indicated that Rothstein was seated at the time the fatal shot was fired by someone standing to his right. The slug penetrated his bladder and intestines and resulted in death-causing sepsis. Authorities believed that Rothstein cardgame losses, reaching into hundreds of thousands of dollars, were related to his murder. Rothstein also was said to have been planning a divorce and had recently been rewriting his will. 1955 - Willie Bioff became well known across the U.S. in the 1940s, as a Chicago Outfit scheme to control motion picture industry unions and extort vast sums from movie companies came to light. Bioff, a Chicago native who relocated to southern California, was a central figure in the scheme. Following Bioff's arrest, he betrayed his underworld colleagues and provided investigators with sufficient evidence to cause the apparent suicide of Outfit leader Frank Nitti (formerly a Bioff friend and defender) and the successful prosecutions of other Chicago bosses. A decade later, all the unpleasantness seemed forgotten. Bioff and his wife were living under assumed names (Mr. and Mrs. William Nelson) in Phoenix, Arizona, and Chicago bosses had served their prison and probation terms. Evidence of some lingering hostility was seen on the morning of Nov. 4, 1955: Bioff climbed into his pickup truck inside his home garage. As he stepped on the starter, an explosion suddenly shook the neighborhood. The New York Times wrote: "The blast threw Bioff twenty-five feet and scattered wreckage over a radius of several hundred. It left only the twisted frame, the motor and the truck wheels. The garage door was blown out, the roof shattered and windows in the Bioff home and several neighboring houses were broken. Jagged chunks of metals tore holes in the wall of a home 100 feet away. The blast rattled windows a mile away." Bioff's body, minus both legs and a right hand, were found 25 feet from the explosion. 1959 - Frank Abbatemarco, who ran a lucrative numbers racket for the Profaci Crime Family of Brooklyn, stopped in at a tavern run by friend Anthony Cardello. Near eight o'clock in the evening, Abbatemarco stepped outside of the tavern and was greeted by two gunmen, whose identities were masked by fedoras pulled down low on their heads and scarves covering their faces. Abbatemarco shouted, "No, no!" but the gunmen opened fire anyway. Wounded, Abbatemarco rushed back into the tavern. The gunmen pursued and methodically pumped bullets into the underworld big shot. They then turned casually and walked out. It became widely accepted that Abbatemarco was killed by his own underlings - members of the Gallo Gang - under orders from Profaci. In the wake of the murder, the Gallos, perhaps unsatisfied with the way Abbatemarco racket assets were divided, broke away from Profaci.